It's Gift With Purchase (GWP) time with Lancôme at Macy's and Macys.com now thru June 7th*, where you can get Free Shipping with a $55 purchase by entering the promo code TRAVEL. However, to be clear, you only have to spend $29.50 to get the gift, but $55 get you free shipping, if you buy online. Got it? Good. It's a pretty nice GWP - it's partially a build-your-own gift. Everyone receives HYPNÔSE Custom Volume Mascara in Black, COLOR DESIGN Sensational Effects Eye Shadow Quartet in Daylight, Dirty Pink, Bikini Golden, & Couture, and BI-FACIL Double-Action Eye Makeup Remover. Then the real fun starts! First, you get to pick your anti-aging moisturizer: RENERGIE MICROLIFT R.A.R.E. Superior Lifting Cream SPF 15 Sunscreen -or- ABSOLUE PREMIUM ßx Replenishing Cream SPF 15 Sunscreen -or- HIGH RESOLUTION REFILL-3X Anti-Wrinkle Cream SPF 15 Sunscreen. Next, choose your lipstick (this would be the hard part for me! ): COLOR DESIGN Sensational Effects Lipcolor [Full-Size] in Visionary -or- COLOR FEVER Lasting Radiance Lipstick [Full-Size] in Rose Defile -or- L'ABSOLU ROUGE Lipcolor Pro-Xylane SPF 12 [Full-Size] in Luxe Mahogany. 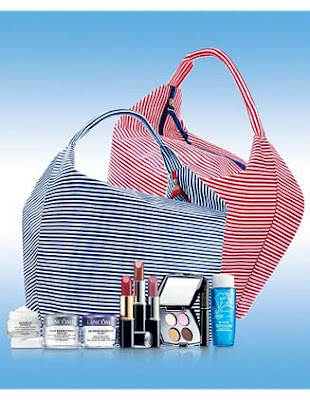 Finally, you get to choose your Lancome Signature Bag in Your Choice of Red or Blue Stripes. Very nautical-looking, perfect for summer!